The 5 Best Things About Renting a Luxury Restroom Trailer | Anderson Rentals, Inc. The 5 Best Things About Renting a Luxury Restroom Trailer – Anderson Rentals, Inc. Especially for those events held in Florida, air conditioning is a nice perk to offer your festival or event-goers. Think of the restroom trailer as a sanctuary for guests, where they can escape the heat and take a moment to breathe. Who likes to leave the bathroom feeling unclean? Having hot and cold running water gives guests the ability to wash their hands and freshen up after a long day of festival going. Much like your restroom at home, luxury restroom trailers come with a full sink and customizable water temperatures. 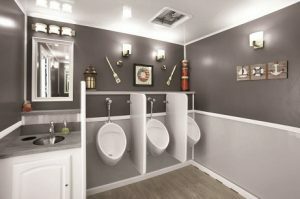 Luxury restroom trailers come decked out with a fully operational plumbing system. So basically, this portable restroom gives guest the ability to flush after use. As with many standard restrooms, the luxury restroom trailer discretely removes waste making for a more pleasant experience for the next guest. Our luxury restroom trailers also come with a ventilation and exhaust system to further eliminate any of the usual portable restroom odors that can be present. Luxury restroom trailers are not only functionable, they can be fashionable too. Many of our trailers now come with interior “mariner” décor that is very pleasing. A luxury trailer adds an element of ambiance to your guest’s restroom experience. Of course, the customer can always add additional decorations such as (shelf/floor)(interior/exterior) plants and/or flowers to personalize the restroom to fit your event if you so choose. Looking for a luxury restroom trailer for your next event? Contact Anderson Rentals. today!